On March 11, 2011, a huge earthquake struck Japan, churning up a devastating tsunami that swept over cities and farmland along the northern part of the country and threatened coastal areas throughout the Pacific. Walls of water whisked away houses and cars in northern Japan, where terrified residents fled the coast. Trains were shut down across central and northern Japan, including Tokyo, and air travel was severely disrupted. A ship carrying more than 100 people was swept away by the tsunami, Kyodo News reported. A fire broke out at the nuclear plant in Onagawa, but Japanese officials said it was extinguished. Prime Minister Naoto Kan said the disaster caused major damage across wide areas. Several hours after the quake, Kyodo News reported 59 deaths, but with rescue efforts just getting under way, the extent of injuries and damage is not yet known. The United States Geological Survey said the earthquake had a magnitude of 8.9, and occurred at about 230 miles northeast of Tokyo and at a revised depth of about 17 miles. The Japanese Meteorological Agency said the quake had a magnitude of 8.8, which would make it among the biggest in a century. It all has to do with plates that make up the Earth’s crust moving around, seismologist James Gaherty, a Lamont associate research professor at Columbia University explained to “Early Show on Saturday Morning” co-anchor Rebecca Jarvis. “Most earthquakes occur on the boundaries of the very large tectonic plates that make up the outer rigid crust of the earth,” Gaherty said. “These plates are all shifting around relative to each other, in many places moving fairly rapidly, inches per year relative to each other, and they push against each other, some places going underneath, other places rubbing past each other. So, the western part of the Pacific Ocean, for example, the ‘Ring of Fire’ (earthquake hotbed along the Pacific Rim) — that all takes place on these tectonic boundaries. That’s where we get these earthquakes. For Elderly, Echoes of War’s Horrors: Hirosato Wako stared at the ruins of his small fishing hamlet: skeletons of shattered buildings, twisted lengths of corrugated steel, corpses with their hands twisted into claws. Only once before had he seen anything like it: World War II. Big quake is latest in cluster that began in ’04: The massive earthquake that shook Japan yesterday, creating a destructive tsunami, is the latest in a series of especially fierce temblors since 2004 — after four decades without such large quakes. No one knows, however, if the recent run of extreme earthquakes — including the 9.1 magnitude earthquake in the Indian Ocean in 2004 and last year’s 8.8 magnitude earthquake off the coast of Chile — portends more large earthquakes around the Pacific Rim in the near future, because there is no way to predict exactly where, when, and how big an earthquake will be. There was a cluster of extremely large earthquakes from 1946 to 1964, a period that ended with the 9.2 magnitude Alaskan earthquake, the second largest since 1900. Powerful Quake and Tsunami Devastate Northern Japan: Rescuers struggled to reach survivors on Saturday morning as Japan reeled after an earthquake and a tsunami struck in deadly tandem. The 8.9-magnitude earthquake set off a devastating tsunami that sent walls of water washing over coastal cities in the north. Concerns mounted over possible radiation leaks from two nuclear plants near the earthquake zone. The death toll from the tsunami and earthquake, the strongest ever recorded in Japan, was in the hundreds, but Japanese news media quoted government officials as saying that it would almost certainly rise to more than 1,000. About 200 to 300 bodies were found along the waterline in Sendai, a port city in northeastern Japan and the closest major city to the epicenter. The Ongoing Response to the Earthquakes and Tsunami in Japan: White House Press Secretary Jay Carney has released an overview of the United States’ reponse in support of our friends in Japan. Joseph Lieberman: “My thoughts and prayers are with the people of Japan and all those affected by this devastating natural disaster, including the thousands of American citizens in Japan. America has no better friend and ally in Asia than Japan, and we in the United States must stand ready to mobilize any assistance we can to help as quickly as possible. The people of the United States stand in solidarity with the people of Japan through the difficult days ahead. News Conference by the President, South Court Auditorium: THE PRESIDENT: Good morning, everybody. Before I begin, I want to say a few words about the terrible earthquake and tsunami that struck Japan earlier today. We currently have an aircraft carrier in Japan, and another is on its way. We also have a ship en route to the Marianas Islands to assist as needed. The Defense Department is working to account for all our military personnel in Japan. U.S. Embassy personnel in Tokyo have moved to an offsite location. And the State Department is working to account for and assist any and all American citizens who are in the country. Tsunami warnings have been issued across the Pacific, and we’ve already seen initial waves from the tsunami come ashore on Guam and other U.S. territories, in Alaska and Hawaii, as well as on — along the West Coast. Here in the United States, there hasn’t been any major damage so far. But we’re taking this very seriously, and we are monitoring the situation very closely. FEMA is fully activated and is coordinating with state and local officials to support these regions as necessary. And let me just stress that if people are told to evacuate, do as you are told. The Earthquake in Japan and Tsunami Preparedness: Good morning, everybody. Before I begin, I want to say a few words about the terrible earthquake and tsunami that struck Japan earlier today. Ken Osgood: FAU Professor stranded on train during Japanese earthquake Dr. Osgood felt the train rock “like a boat.”: Some South Florida residents found themselves caught right in the middle of the calamity in Japan. An FAU history professor and his wife experienced one of the worst natural disasters in history when the massive quake struck. Dr. Ken Osgood teaches in Palm Beach County; however, he’s in Massachusetts right now, working as a visiting professor. On Friday, he and his wife, Rachel, were on a bullet train outside of Tokyo when everything came to a stop. FAU professor tells of horror in Japan: “We had a harrowing 36 hours — easily the most stressful and frightening of our lives. We were on a bullet train to Tokyo when the earthquake struck. The train stopped. All power off. It rocked like a boat on the tracks. Then we were stuck on the train for five hours, much of it without power. “Because of the language barrier, and the general confusion, only gradually did we learn that Japan had been struck by the largest earthquake in its history, the fifth largest ever recorded anywhere. Slowly, very slowly, we began moving again. When we finally pulled into Tokyo, we were among thousands of stranded people. “After walking the city for several hours in search of a place to go, we spent the night sleeping in a hotel lobby. The staff graciously fed us soup and provided us showers. That night, Tokyo experienced one aftershock after another, some 50 of them, many above 6.0. All trains and buses were stopped. Phone lines were jammed. We didn’t know if we could make it to the airport, or if, upon arriving there, we would be stranded with throngs of other passengers seeking a way out. “I called my Dad in the U.S. time and again, while he made call after call to the airlines seeking a way for us to get home. Holding on to what I was sure was a very vain hope, we headed to the subway the next day in the hopes of finding some way home. With a throng of people, we boarded one of the very first trains to go north towards Narita airport. “It was a slow ride. En route we received word that the nuclear reactor to the north of us was releasing radioactivity to prevent it from going critical. The previous day we had visited Hiroshima, and the news sent our heart rates soaring. We imagined the worst. “Then miracles happened. We made it to the airport without incident. With Rachel crying away at the ticket counter, and me barely keeping it together, we got tickets on the next outbound flight to the US. We breezed through security, customs, and passport control, arriving at our gate minutes before boarding began. We loaded the plane quickly, and we ended up on a virtually empty aircraft all to ourselves. “Earplugs, eye masks, and sleeping pills did the trick — woke up about an hour before landing. I was never so happy to be on a plane, and never has anyone been so happy to be in Detroit. Joseph Laker: Local Professor Reflects On Living In Japan, Earthquake Devastation: Joseph Laker, a history professor at Wheeling Jesuit University, said Japanese are excellent at responding to natural disasters, but this is on a whole different level. Laker taught English and lived in Japan for about four nonconsecutive years and has been back many times. Recently, he received an e-mail from a friend and former student in Tokyo, miles away from the disaster but still affected. Because of the damage inflicted by the earthquake and tsunami, several nuclear reactors located near Tokyo are in danger of leaking radiation. McClain wrote that the Japanese rely on these power sources for one-third of their electrical energy, and these reactors are mostly concentrated in areas at risk for earthquakes. History proves Japan can rebound: “They have lived through such big disasters in the past,” University of Regina International Studies professor Nilgun Onder said. It was the same kind of scene in 1945, after two atomic bombs were dropped on Nagasaki and Hiroshima. Japan is no stranger to devastation. The country has seen its fair share of earthquakes over the decades. Yet, according to Charrier, the people will still approach this disaster with a positive attitude. 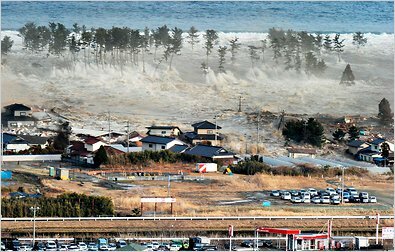 History Lesson: Massive Earthquake in Pacific Northwest Triggered Japan Tsunami in 1700: About 300 years before the current earthquake/tsunami disaster in Japan, another wave of water swept the Island nation, wreaking havoc and laying waste to entire coastal villages. That tsunami was caused by a massive quake–estimated to have been a magnitude 9.0–that rocked the entire Pacific coast from British Columbia to northern California. According to a U.S. Geological Survey expert and a former University of Washington scientist, the great tremor of 1700 and ensuing “orphan tsunami” could happen again, and Americans should learn from both it and the present situation in Japan. David Yamaguchi and Brian Atwater are the authors of “The Orphan Tsunami of 1700–Japanese Clues to a Parent Earthquake in North America,” published in 2005 by University of Washington Press. The tome details a giant–yet, prior to their research, unconfirmed –earthquake that struck the Washington coast and Puget Sound area in the year 1700. RYamaguchi says the current chaos in Japan is keeping him glued to the TV. About a decade ago, when he was researching the book, he traveled to some of the same coastal cities that have been hit by the tsunami. Back then he saw evidence of previous tsunamis–things like “sand sheets,” mud and silt deposits left by the waves sweeping over normally dry land–but had a difficult time envisioning the same thing happening in the present. The ceremonies centered around the mourning-draped veranda of the Arlington mansion, once the home of Gen. Robert E. Lee. Various Washington officials, including Gen. and Mrs. Ulysses S. Grant, presided over the ceremonies…. Today is more than the end of a three-day weekend. It’s a day to honor the deceased — especially those men and women who have served this nation in the armed forces. Unfortunately, over the years Memorial Day has lost much of its meaning. Today, families look upon the Memorial Day weekend as the unofficial start of summer — especially when the weather cooperates. It’s an opportunity to get away to the beach or the mountains, have a picnic or family reunion or the first opportunity of the year to pitch the family tent at a favorite campground. Sadly, not many of us take the time to remember the dead or say a prayer for the 1.2 million uniformed men and women who have made the ultimate sacrifice so that we might thrive as a nation blessed with freedom and liberty…. Some conservative talk show hosts and pundits have mounted an effort to politicize Memorial Day by questioning President Obama’s plan to visit a national cemetery in Illinois instead of attending the annual ceremony at Arlington. Back in 1983, a Defense Department official laid the Memorial Day wreath at Arlington when Ronald Reagan was at a G-7 Summit meeting in Williamsburg, Virginia…. President Obama and the first family are wrapping up their weekend visit to Chicago. Obama is expected to give the address at a Memorial Day Ceremony at the Abraham Lincoln National Cemetery in Elwood, about 50 miles south-west of the city. The service will be accompanied by music from the Joliet American Legion Band and readings from students of the Elwood Community Consolidated Elementary School. Back in Washington, Vice President Joe Biden and Jill Biden will host a breakfast for Gold Star Families at the White House. Afterwards, the Vice President will visit Arlington National Cemetery where he’ll participate in a wreath laying ceremony at the Tomb of the Unknowns. Collectively, the generation of soldiers, sailors, airmen, and marines who have served and sacrificed for us are the heart and soul, and I would say, spine of this nation. And as a nation, we pause today to remember them. They gave their lives fulfilling their oath to this nation and to us. And in so doing, they imparted a responsibility on us to recognize, to respect, to honor and to care for those who risked their lives so that we can live ours. Moments ago, I had the distinct honor and high privilege of laying a wreath at the Tomb of the Unknown Soldier. This morning, I welcomed to the White House the Gold Star families, who know all too well the price of their loved ones’ patriotism. I met Ruth Stonesifer, the current President of the Gold Star Mothers, who lost her son Kristofor on the first night of major operations in Afghanistan on October of 2001; and Emogene Cupp, the mother who played a pivotal role in the early stages of the Vietnam Veterans Memorial and unveiled the first panel; to Terry Davis, a remarkable champion of Gold Star families. Terry, God love her, is a Gold Star sister, a Gold Star wife, and a Gold Star mother — none should be asked to sacrifice that much. Remarks of President Barack Obama, Saturday, May 29, 2010, Weekly Address, Washington, DC: This weekend, as we celebrate Memorial Day, families across America will gather in backyards and front porches, fire up the barbeque, kick back with friends, and spend time with people they care about. That is as it should be. But I also hope that as you do so, you’ll take some time to reflect on what Memorial Day is all about; on why we set this day aside as a time of national remembrance.